Something called www.ask.metafilter.com has made the Independent's list of 101 really useful websites. Just so you know. Current topics awaiting advice include what to do when a Mac shows the "blue screen of death", what financial aid is available to students and why cats follow you into the bathroom. Could someone please link to a Mac BSOD? Where do you send an email to get them to fix the error? It's a nice gesture and all, but geez, if you don't get the URL right, what's the point? Shhh, if they fix it more people will show up there. At least this way only the semi-intelligent ones will make it. Sounds like a question for www.ask.metafilter.com? I can't tell you how much I hate the phrase "hive mind". My girlfriend dumped me! Help me, hive mind! This is the first image hit at google. Come on, people. 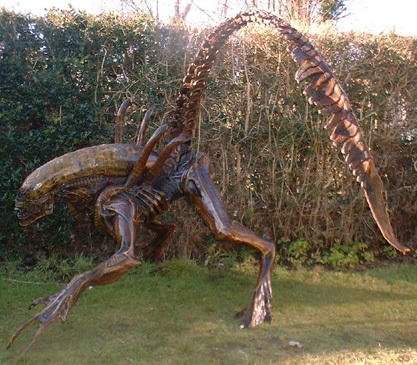 I want one of those sculptures for my front yard. I picked the most likely email from the Independent Contact Us page, that being the online edition's editor Martin King. I can't tell you how much I hate the phrase "hive mind". I always liked the sound of "Querying the bird brain." I can't tell you how much I hate clueless clients who call up incensed because they slapped an uncalled-for "www" in front of the actual URL of their test sites, and got an error page. Then, when you tell them to drop the "www", they're all like "WHAT??? you can have URL without 'www'?" I just setup www.ask.metafilter.com to point to the proper site, so it'll work now. This is the Independent singled out by Our Dear Leader Tony Blair as an enemy of the state, so we must keep this recommendation quiet. from the authorities. Well heck, then ask Matt to take it off the top of every AskMe page. Ha! I musta come in the side door! And how do you explain your Fark presence, MCD???? Um, so I have heard. Not that I have seen you there. While browsing under my handle of Fuzzy Skinner. Not at all. Well heck, can you believe I never noticed. I can believe it; you're not the only one who's been caught by that trap. It is one of the wonderful little ironies of the site, though. He gives the place a certain respectability. He's the Inara of Fark. Fark is like the MeFi Bizarro World. And MCD straddles both worlds. Thank God he wears underwear. I figured you didn't. As Cortex said, you are not the first. Leave it to MeFi to encourage irritating behavior by the posters. I agree with you though. It. Sets. My. Teeth. Absolutely. On. Edge! It's almost as annoying as people who Write. One. Word. Sentences. For. Effect. "Shhh, if they fix it more people will show up there. At least this way only the semi-intelligent ones will make it. And how do you explain your Fark presence, MCD????" Fark is full of semi-intelligentsia. Not to get all literal, but I propose the following logo change. no one requested it [lately], but I always wanted to do random images on the main page [again]. for AskMe too! Can you do ww.ask.metafilter.com as well? Sometimes I fumble when I try to type it all out. www.ask.metafilter.copm would be awesome as well. Oh, heck, just have Microsoft preinstall the icon on everyone's desktop by default. actually in the middle of a project moving 75+ domains from one GSM to another, and half of 'em are just www. variants; makes me want to shake a stick. Grr. no one requested it [lately], but I always wanted to do random images on the main page [again]. I miss those! Can they be brought back? Maybe only for logged in members if it's a usability issue? Please pretty please? Sometimes I fumble when I try to type it all out. www.ask.metafilter.copm would be awesome as well. Heh. I can't tell you how many times I've visited General Motors' website trying to check my email. I haven't been able to answer questions at AskMe since my mind hives healed. My girlfriend dumped me! Help me, hive mind! This is the first image hit at google. Oh come now. You've just been dumped. You don't feel like calling on the assistance of a ravenous alien killing machine? Not even for a moment? HA! Yep, and even better, gm.com is now one of my autofill options! The Deej: "HA! Yep, and even better, gm.com is now one of my autofill options!" If you're using Firefox, type "gm", use the arrow keys to highlight the autofill choice, and hit Shift-Delete. And in other news, MetaFilter gets namechecked 8 times by the likes of the Yorkshire Post, the Washington Post, Wired, Chicago Tribune and Bahrain's Gulf Weekly according to Google News. But, stop the presses ! Fark gets a mention in 65 hits. Once again, Fark is underwhelmed. Just for the record, y2karl, Drew "The Biggest Farker" Curtis is out promoting a book with the same name as the website. That certainly will hype its press mentions, which, since the book is about dumb things the Establishment Media does, like responding to obvious hype, is way too Ironic for the Fark Ironic tag. I'm so proud. We're all very useful engines!